Noted marine wildlife conservationist and artist Guy Harvey will be at USF St. Petersburg Sept. 11 to present Tiger Shark Express, a documentary he co-produced covering five years of expeditions he led in the Atlantic Ocean to study tiger sharks. Harvey will screen the film at 5 p.m. at the University Student Center ballroom, 200 6th Ave. S., and take questions afterward. The event, which is free and open to the public, is sponsored by the USFSP Student Government Association. 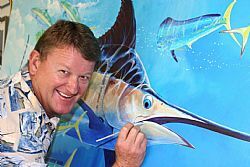 Harvey has a Ph.D. in marine biology but is best known for his colorful paintings of sportfish that have been reproduced on clothing, posters, prints and other items. The Guy Harvey Ocean Foundation funds the Guy Harvey Research Institute at Nova Southeastern University in Fort Lauderdale. The NSU facility is focused on protecting marine life from overfishing and the loss of habitat.